Hellfire II missile components exposed through a transparent casing. 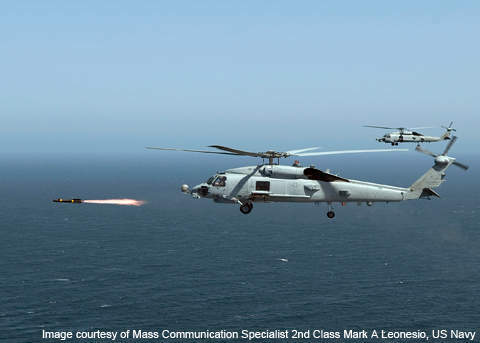 An MH-60R Seahawk of the US Navy fires the first of four live Hellfire II missiles. 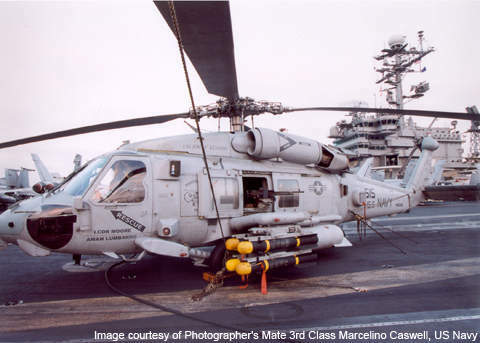 An SH-60 Sea Hawk, armed with AGM-1148 Hellfire air-to-ground missiles. The US Army soldiers load a Hellfire II missile onto the mounting bracket of an AH-64D Apache helicopter. 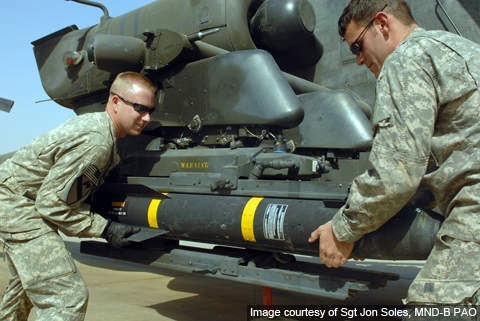 Army Fleet Support employees prepare to load a semi-active laser Hellfire II missile onto an OH-58 Kiowa. The Hellfire II air-to-ground missile system (AGMS) provides heavy anti-armour capability for attack helicopters. It is a 100lb class air-to-ground precision weapon delivering multitarget capability and precision strike lethality. The Hellfire II missile is in service with the armed forces of the US and 16 other nations. In August 2005, a Hellfire II missile was successfully fired from Australia’s Eurocopter Tiger armed reconnaissance helicopter (ARH) which is the first non-US platform to integrate Hellfire II missile. "The AGM-114 II Hellfire is an air-to-ground missile developed primarily for the anti-armour role." The US Army awarded a $170m contract to Lockheed Martin in July 2006 for Hellfire II missile systems. In June 2007, France selected the Hellfire II missile to equip its hélicoptère d’appui destruction (HAD) Tiger attack helicopter fleet by 2012. The letter of offer and acceptance (LOA) was signed in February 2008. In October 2007, the Governments of Greece and the US signed an LOA for additional Hellfire II missiles for Hellenic Navy’s SH-60B Seahawk helicopters. In August 2008, Lockheed Martin received a $357m contract from the US Army for the missiles. The contract also provides options for 200 training missiles and up to 1,200 missile variant conversions. The development of the Hellfire missile system began in 1974 with the US Army’s requirement for air-to-ground missile launched from helicopters against armoured fighting vehicles. Production of the base model AGM-114A commenced in 1982. The development test and evaluation (DT&E) launch phase of the AGM-114B took place in 1984. The DT&E on the AGM-114K was completed in FY93 and FY94. In FY98, Congress allocated $20m for the procurement of 100 AGM-114M missiles and 100 CATM-114K training missiles. Deliveries of CATM-114K missiles were concluded in April 2000. AGM-114M missiles were delivered in December 2000. 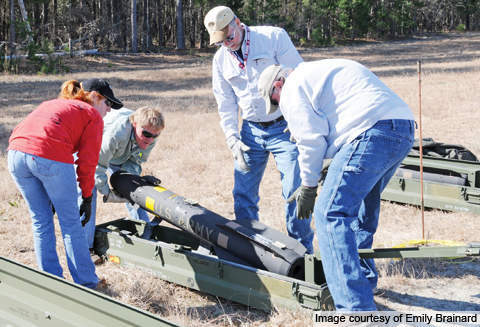 A total of $20m was added in FY00 for the procurement of 225 additional AGM-114K missiles to meet shortages in the inventory. 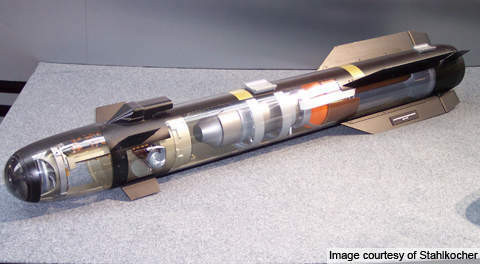 The Hellfire II missile is currently produced in five variants. AGM-114K is a high-explosive anti-tank missile equipped with a tandem shaped-charge warhead to defeat all current and projected armoured threats. The MMW radar Longbow Hellfire (AGM-114L) missile provides fire-and-forget capability even in adverse weather conditions. The AGM-114M is a blast fragmentation missile designed for soft targets such as buildings, bunkers, light-armoured vehicles and caves. The AGM-114N is a metal augmented charge (MAC) variant deployed against enclosed structures with minimum collateral damage. The AGM-114R multipurpose missile is the latest in the Hellfire II missile range. Also known as the Hellfire Romeo, the missile integrates capabilities of all previous Hellfire II variants equipped with semi-active laser (SAL) seekers into a single missile, defeating a range of targets. From launch to detonation sequence, the Hellfire Romeo incorporates a variety of technological improvements that enhance its effectiveness and utility. The first proof-of-principle (POP) flight test for AGM-114R was successfully conducted in October 2009, while the second POP was completed in April 2010. Lockheed Martin conducted the third POP test in August 2010. Sixth and the final POP test was conducted in March 2011. All the tests were successfully carried out at Eglin Air Force Base, Florida. The payload and systems are housed in a metal airframe featuring two sets of cruciform wings. The airframe includes five modules incorporating laser seeker, warhead, guidance section, propulsion and control section. The Hellfire II missile has a length of 1.62m, a diameter of 17.7cm and a wingspan of 0.71m. "The Hellfire II air-to-ground missile system (AGMS) provides heavy anti-armour capability for attack helicopters." Each Hellfire weighs 45.4kg-49kg including an 8kg-9kg multipurpose warhead. It has 8km (LOAL, high trajectory), 7.1km (LOAL, low / direct trajectory) and 11km (UAS: LOAL, high trajectory) range depending on the trajectory. Hellfire II can lock onto targets before or after launch for increased platform survivability. For anti-armour roles, the AGM-114 missile is equipped with a conical shaped charge warhead with a copper liner cone forming the jet for armour penetration. The high-explosive, shaped charge and blast fragmentation warhead is effective against appliqué and reactive armour. The Hellfire can be used as an air-to-ground or an air-to-air missile. The AGM-114 provides precision striking against tanks, structures, bunkers and helicopters. The missile can be guided towards the objective either from inside the aircraft or by lasers outside the aircraft. The multipurpose missile supports firing from rotary and fixed-wing aircraft, unmanned aerial systems (UASs), ground-based tripods, ground vehicles and boats. The Hellfire has also been tested on ground-based tripods, ground vehicles and boats. Rotary wing platforms include the Apache, Kiowa Warrior, Cobra and Seahawk, as well as the Tiger armed reconnaissance helicopter (ARH) of Australia and the Tiger HAD of France. Fixed-wing platforms include the unmanned Predator and Reaper drones, as well as the manned Cessna Combat Caravan aircraft. Hellfire Romeo can be fired autonomously or with remote designation. Hellfire is propelled by a single stage solid propellant Thiokol TX-657 solid-fuel rocket motor. The motor can generate 10Gs of initial thrust. The missile has a maximum velocity of 950mph.